Cleats worn by Yasiel Puig in honor of Vin Scully. July 29, 2016 - Major League Baseball has informed Los Angeles Dodgers outfielder Yasiel Puig that he can no longer wear the cleats he has been wearing in honor of Dodgers announcer Vin Scully. 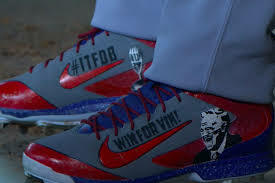 The cleats, which Puig debuted last week, display an image of the broadcasting legend and the phrase "Win for Vin!" on the outside, and a microphone and the hashtag "ITFDB" for Scully's famous saying, "It's time for Dodgers baseball," on the inside. The ASA Hall of Famer is hanging up his microphone at the end of the season after 67 years. A letter was sent to the Dodgers star stating that the cleats don't adhere to the league's uniform policy and he should refrain from wearing the flashy footwear or face a $5,000 fine. Apparently, it's not so much the image and wording that's the problem, but that the cleats are orange, violating the uniform policy which states that teams are only allowed to wear cleats that utilize the team's official colors.